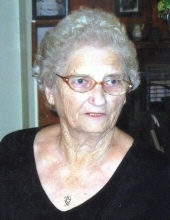 Mrs. Betty Jo Roach Gentry, age 85, of Rockmart, GA passed away Sunday, January 13, 2019. She was born in Cave Spring, GA on October 18, 1933 a daughter of the late Sherman Roach and the late Clara Haney Roach. Mrs. Gentry had lived most of her life in Rockmart, attended Emmanuel Baptist Church, loved to quilt, sew and enjoyed reading. In addition to her parents she was preceded in death by her husband, Charles W. Gentry, Sr., son, Charles W. Gentry, Jr., brother, Edward Roach and sister, Libby Hendrix. She is survived by her son, Alvin (Lynn) Gentry of Rockmart; granddaughters: Mandy (Jason) Gable and Michelle (Stephen) Hendrix both of Rockmart; great grandchildren: Logan Gable, Carson Gable, Lily Hendrix, Braden Hendrix and Gavin Hendrix; brother, Bill Roach of Bremen and sister, Joyce Koone of Rockmart. Funeral services will be held Wednesday, January 16, 2019 at 1:00 pm in the chapel of the Alvis Miller & Son Funeral Home with Rev. Charles Garrett officiating. Interment will follow in the Mt. Tabor Baptist Church Cemetery. Pallbearers are Jason Gable, Stephen Hendrix, Logan Gable, Carson Gable, Braden Hendrix, Gavin Hendrix and James Bearden. The family will receive friends Tuesday evening from 6:00 pm until 8:00 pm at the Alvis Miller & Son Funeral Home. The Alvis Miller & Son Funeral Home is in charge of arrangements for the funeral of Mrs. Betty Jo Roach Gentry. To send flowers or a remembrance gift to the family of Betty Jo Roach Gentry, please visit our Tribute Store. "Email Address" would like to share the life celebration of Betty Jo Roach Gentry. Click on the "link" to go to share a favorite memory or leave a condolence message for the family.